Our designing team is an artist-driven full service production unit where designers work with a variety of communication tools in order to convey a message from a client to a particular audience. No matter, whether we are into a big project or a small job, we focus equally and sincerely to satisfy our esteem client. Since 1993, this organisation has been recognized as one of the preeminent full service advertising and designing firms serving a regional, and national, client base. Graphic design is the creative process of communicating visually using typography and images to present information. It combines art and technology to communicate ideas. Our Graphic designers embrace a range of cognitive skills, aesthetics and crafts, including typography, visual arts and page layout. Like other forms of design, our graphic designers often refers to both the process (designing) by which the communication is created and the products (designs) which are generated. In desktop publication we author services like typing, setting and printing books, leaflets, bills and office stationeries in English and in regional languages also. Amongst most popular.. Flash and power-point presentation designs. logo designing with trade mark registration. artworks for wide format and signage designs. Starting from a letter press treadle machine since 1977 ending to a multi colour offset, we have gradually stepped up with a keen focus to satisfy our customers need with accuracy and quality. We have concentrated deeply in the fields like..
With the advent of technology and with demanding timeframe of each of us, we have upgraded ourselves with a high end digital machine for high quality and short run jobs. In this field, we cover up various paper media and sizes so as to cater our customers need in a wider view..
For various special Books, Magazines and other bulk or quantity jobs we are featured with high end 4 colour offset print systems. Sizes up to 23 x 36 inches . 65 gsm to 350 gsm paper and board media. Besides the digital media we are also enriched with the high quality eco solvent printer that can print up to 62 inches in width irrespective of any length. For the last couple of years this eco-solvent print market has taken a good consistent growth in various fields of advertising and branding because of its high quality product with a very cost effective run cost. Grey back and white back banner media. Translide media or Glow sign. Printing boards, boxes and gift items . Printing on plastics, fibre, acrylic or metal bodies. Widely popular for cost-effective paper and envelope printing. Books of various sizes and types are binded with ease. Books like magazines, journals, thesis, souvenirs and school stationeries, ledgers attendance record books are well taken care in this house. The unit for label cutting and half cut is very supportive for sticker cutting, tag and label punching of different sizes. The thermal lamination unit can laminate spotless in no time for digital products in matt or gloss films with the maximum width of 13 inches and also well featured with texture lamination. We provide complete packaging for CD/DVD albums of various types and boxes including printing, duplication and shrink-wrap process. We are also authorize by some well know music label companies and real estate groups of the city. The most important and well equipped packaging unit is also featured by the association of an excellent courier service for doorstep delivery throughout the globe. Stationery items like pads, bill books, receipt books specially brochures, newsletters, danglers and various cut outs are well versed with our section..
For eco-solvent print products a sun board pasting and lamination on it, is a common trend for beautification of the display and also for preserving it for a long time irrespective of indoor and outdoor signage. The cold lamination is best practiced with eco-solvent pints like front lit vinyl, back lit vinyl and other eco-solvent products and it is also well accepted for texture papers and special photo prints. 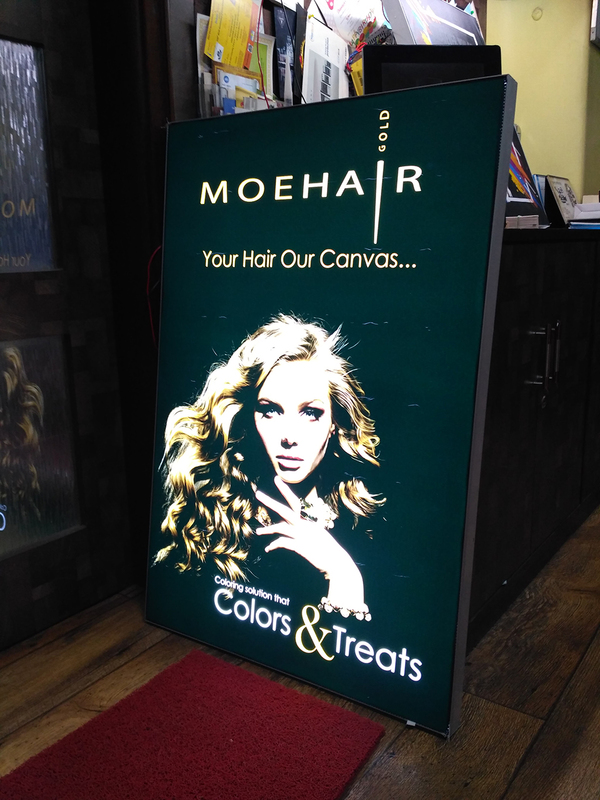 Irrespective of 50 inches width it can laminate up to 120 sq. ft.